It boggles my mind that this fountain of knowledge pizza-man was in essence, telling the people who have been hurt by the financial crisis through no fault of their own, that they were in fact, to blame. The classic blame the victim stance from a not-so-classy ex-pizza CEO running for the Republican nomination for President. When the Cain circus first came to town many people thought he was a breath of fresh political air. Here was a guy who had no political background or knowledge, did not necessarily have command of the English language, knew nothing about those foreign places like China etc. and had a simplistic 9-9-9 economic fix that would cost the most needy more money. That fresh air has quickly grown stale. In the last few weeks no less than four women have stepped forward and accused Cain of sexual harassment that allegedly happened years ago, when he was head of the National Restaurant Association. Three of the women did so anonymously and one came forward complete with a press conference and attorney/spokesperson by her side. Cain and his camp were very slow to respond to these allegations, refusing to talk to reporters about the issue for days. He kept telling reporters he wanted to “stay on message” and “don’t bother asking.” When he evidently regrouped and got all his Republican ducks in a row, he had a press conference himself yesterday and stated none of the events ever happened. He is of course, calling four women with similar stories liars. Two of the women had been paid off years ago by the NRA and signed agreements to not speak on the issue as they had been employees. This action alone would lead reasonable people to think their could be some truth to the accusations. It is not uncommon for powerful men, bosses and those in control of others to use that power in unethical and demeaning ways. 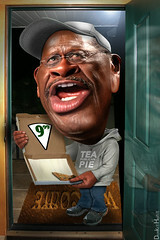 I do not know if Herman Cain did what he was accused of but four women stating they have had similar encounters with him certainly shows a pattern of behavior that would be unbecoming a President of the United States. And if the allegations are true, he would also be guilty of lying to the American People, which might not be such a stretch from what we are used to with our present politicians.